A story came full circle on Tuesday morning in Bahrain, when Mick Schumacher stepped into the cockpit of a Ferrari Formula 1 car 12 years and four months after his father Michael vacated one for the last time. Two days of testing in Bahrain – one for Ferrari followed by one for the affiliated Alfa Romeo team – are the first steps in a plan aimed at establishing whether the son of the most successful grand prix driver in history has the talent to follow his father’s footsteps into F1. Michael’s success and fame mean 20-year-old Mick will have to do this in a spotlight with which most aspiring F1 drivers do not have to contend. But there is another dimension, too – Michael’s health following the skiing accident in 2013 which left him with severe brain injuries, since when he has not been seen in public. The Schumacher family will not speak about Michael’s condition, believing that he would want it that way – he was always a very private man. But it is inevitably the elephant in the room in any interaction Mick has with the outside world, and particularly the media. Holding his first news conference at a grand prix in Bahrain last weekend, there was a calm composure in the way Mick dealt with any questions relating to his father, however oblique. What does he feel about all the extra attention he receives through being Michael’s son? But it is something other drivers don’t have to face. What did you learn from your dad about being a racing driver? Anything specific about driving, about racing, about how to handle the whole business? Mick – then just 14 – was skiing at his father’s side when Michael suffered the accident that changed his life. The emotional torment must have been horrendous, but a career in motorsport already beckoned, and with it the need to find a way to navigate the inevitable attention that comes with being his father’s son. Those close to him have worked hard to protect him, create an environment in which he could grow, and at the same time prepare him for what they knew was to come. His mother, Corinna, and his manager, Sabine Kehm – who used to be Michael’s manager – have been key. But there have been others, too, offering advice along the way. “I’ve known him since he was little boy,” says Ross Brawn, the engineer who worked with Michael pretty much throughout his F1 career. “It’s been fascinating. There was a period where he wasn’t sure but he’s now got the bit between his teeth. “He’s a very determined young man and it is fascinating how his competitiveness kicked in last year in Formula 3. People who know him or spend more time with him than I do say it has been impressive progress in his driving career in the last 12 months or so. “He is a very nice young man and staying like that with the pressures and challenges that come will be one of the things that will be challenging for him. But I’m sure he will. “He’s got a very balanced family and they’ve all known the experience from Michael so they’ll know how to handle it if Mick is successful. Ferrari driver Sebastian Vettel, who first had Michael as a hero and later became his friend, has known Mick for many years. He adds: “The name brings some expectations but to end up in F1 you need to prove you have the speed. so far he has done really well. Mick dabbled in go-karts from a very early age and started racing seriously at the age of 12. In 2015, aged 16, he took the step into cars, but at that stage, according to those who knew him, he projected a sense of simply having a lot of fun rather than a laser focus on F1. People grow up at different rates, and Mick would not have been ready for a move to F1 at the age of 17, like Max Verstappen, a family friend – Max’s father Jos was team-mate to Michael at Benetton in 1994, and they remained close afterwards. There seems, though, to have been a step change over the winter of 2017/18, as Mick prepared for his second season in European Formula 3. He went into the season with a new level of confidence. An early mishap when he suffered a suspension failure over a kerb at the Pau street track in France set him back, but by mid season he hit his stride and became close to unbeatable. Mick describes this as “just like a knot that popped, that opened, and then everything went the right way”. Since 2016, Schumacher has driven for the successful Prema team – an alma mater for F1 drivers Charles Leclerc, Esteban Ocon, Pierre Gasly, Lance Stroll and Antonio Giovinazzi. “Mick is someone who has to understand everything 100% and then he put everything you say to him into practice,” says Prema team boss Rene Rosin. “He is very technical. He wants to understand every small detail, every characteristic of tyres, engine, everything of the car and then when he has everything clear, is the moment when he is able to perform at his best. “He is very, very good in the race. In F2, it is a question mark because the Pirelli tyre is demanding a different driving style on the race, but in F3, when you push all the laps, he was able to put the car in the right place in the right moment. All the time – always good at the start, always good in the first corner, always being in the right spot. Rosin says he expects Mick to follow his predecessors into F1 and, as for handling the weight of his family name, he says: “It is a personal aspect for himself. We are concentrating on working with Mick as a driver and we want consider him as Mick. 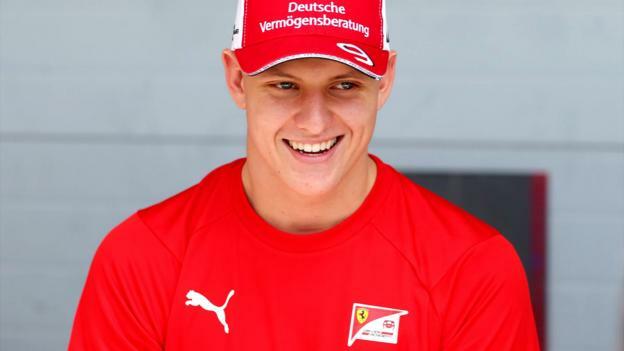 Schumacher has spent the winter preparing for his F2 season, and said in Bahrain that he would not start to focus on the F1 test until after his weekend of racing had finished. Did he think he was ready for it? A smile. Arms folded. Blue eyes fixed on the questioner, obvious intelligence behind them. His mouth puckered a little, just like Michael.